I have a real treat for you this week. 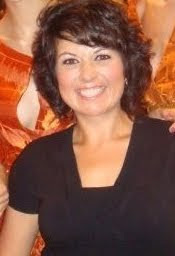 I bring you the fabulous and talented Angi Wingle, Creative Nail Design Educator and founder of Goindulge. I've had the pleasure of speaking with Angi multiple times backstage at Fashion Week over the last few seasons and this gal knows her stuff. I always look forward to hearing her interpretations of the shows and the trends, not to mention the nail tips and tricks that spill forth in just a few minutes each time. My nail regimen has grown by leaps and bounds from knowing her! Find out how she first became interested in nails, her all-time favorite CND product and so much more, after the jump. I'm from the east Texas area. On the corner of Louisiana and the Gulf of Mexico (lol). Back home it is referred to southeast Texas. That covers the Houston region. I lived in Houston part of my life and graduated high school and cosmetology school in the Beaumont area. While in cosmetology school, our school offered to us an opportunity to buy an "acrylic" nail kit. I thought it would be fun! Before that, I probably never even polished my nails. That was early 1986. We saw a brief demonstration and were on our own. I read the directions step by step and found it very time consuming to self-teach. The kit I purchased in cosmetology school was a Creative Nail Design student kit. I loved the thorough workbork/instructions. Once I started doing hair in my first salon job, I realized there was a need for someone to do nail enhancements. I volunteered my experience of basically doing nails on myself up to that point. The chain salon I worked for was great about advanced education and they offered a CND class which really took me to the next level. It was great to be able to be so versatile in the salon starting out. The manicurists that have taught me the most were educators from CND. I cannot remember their names because that was 13 to 14 years ago. But what I do remember is that CND has always stood out as the leader in nail service products for manicurists and nail enhancement specialists. So naturally, when I decided I wanted to help people in the nail industry, I chose CND and CND chose me. When did you become involved with CND, and what inspired you to work with the line? I have seen CND's innovations through the years and continue to see it. About 7 or 8 years ago, I had a chance to work Fashion Week for a few days for CND and that opened up a new world for me (not to mention my eyes). Nail polish wasn't just polish anymore. It wasn't just color anymore. It was becoming fashion. CND paved the way for our industry, making designers aware that nail color is an important accessory that completes the total look! 1) Every Fashion Week is a highlight. 2) Meeting celebrities are always a highlight. Once I flew to Atlanta to give Usher a manicure and pedicure. I have done manicures on these celebrities to name a few ... Jack Nicholson, Tommy Lee, LeAnn Rhimes, Serena Williams, Billie Jean King, Sheryl Crow, Danica Patrick, Felicia Rashad, Christie Brinkley and Mary Lynn Rajskub. CND's new COLOUR AND EFFECTS line is my all-time favorite nail color line. I love the range of colors, the fact that there are warm, neutral and cool colors in each color range AND I love the drying time and wear time. It's great to be able to create something different every day with the line. Oh, and did I mention you can purchase them from my hand and foot beauty site, GoIndulge.com?? Nail products ... I only use CND, of course. Out of all the manicure and pedicure stuff CND offers, my favorite product is Rejuvenator. It is a cream that heals skin. It's unbelievable. I keep it in my purse. It keeps my cuticles young-looking (lol). Brands...I'm a fan of branding, but I usually look at the ingredients first of anything I may be interested in buying. Will I benefit from the ingredients, is there an ingredient that has a high allergy rate, is there an ingredient that may actually cause my skin to be dry??? 1) Stay out of the rain. Ha. No, really, stay out of the water. I know you have to wash your hands, I give you that one. But do you have to wash dishes or use household cleaners without gloves??? And then wonder why your hands, cuticles and nails are cracking and peeling? My tip is buy a box of disposable gloves and keep them under the sink in your kitchen. So easy. 2) Stay away from anti-bacterial soaps. You know how to wash your hands properly, and that is sufficient. Anti-bacterial soaps are great for killing bacteria but it starts to work on the skin, too. Hand washing for 30 seconds with regular soap is going to do the job without over-overdrying your skin. 3) Use Creative Nail Design Solar Oil whether you follow the first two nail tips or not. 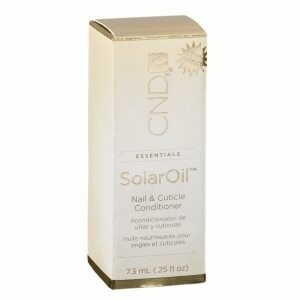 SolarOil not only conditions your cuticles and skin, it conditions your nails. Daily use makes your nails "water resistant" up to 20 feet (joke). No, really, SolarOil will help your nails resist the breakdown from water, the daily dirt from staining the underside and it will deter that peeling (in layers) on the edge of your nails. SolarOil 2 times a day. Little dab on each nail and rub it in. It will absorb and start working for you immediately. My kids! I have 4 but my oldest is married so only 3 at home. Ages 24, 15, 10, and 7. 3 girls, 1 boy. I play soccer on Friday nights. I play volleyball on Wednesday nights. I buy and listen to music weekly. I'm a music addict. I have 5000+ songs on my iPod. Amateur photographer. Amateur dog trainer. I have a Jack Russell/Chichuachua mix 3 yr old that I have trained to do "tricks" by command or sign language. She's a lot of fun and I love her energy. I recently discovered Facebook this year and that is a lot of fun. Connecting with family, old friends, new friends and networking.